Dates season has started in Singapore and many shops have been loaded with stocks of Dates. We generally get a lot of dry fruits – particularly dates during the month of May & June from various parts of the world. 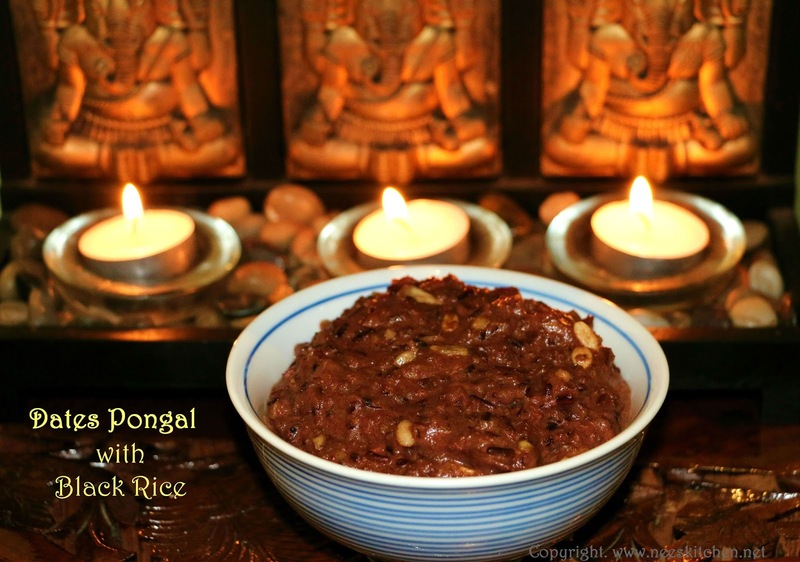 Sweet Pongal is a dish which is cooked in many festivals in Tamilnadu. 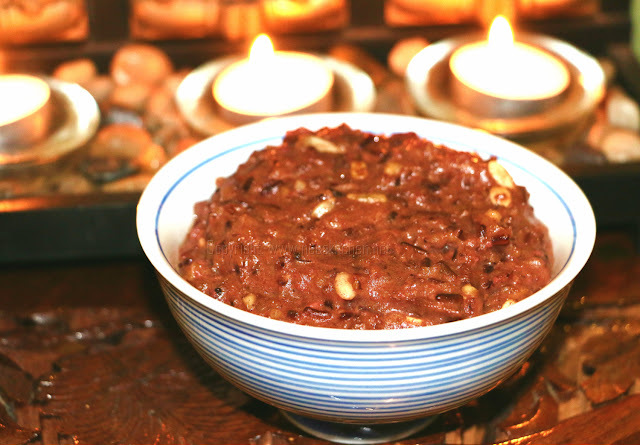 We generally add jaggery to this dish, however here is my way of cooking with Dates. By cooking with Dates the dish is completely guilt free for people who are diet conscious and those with diabetes. I have not added the Chana dhal for this Pongal, instead added a good amount of pine nuts & pumpkin seeds. For healthier reasons I have cooked with black rice instead of regular rice. You may use the regular rice also. 1. Soak black rice with 6 -8 hrs. 2. Remove the seeds from dates. Add 2 spoons of ghee and add the dates and saute for 4 mins. 3. Pour the milk little by little and cook the dates completely. 4. Parallel grind the black rice , just 1 round in the mixie. 5. Add the black rice to the date mix . Add 2 ½ cups of water. 6. Add the elachi powder and saffron. 7. Close the cooker and allow it to whistle 12 times or thrice the regular Pongal cooking. 8. Once the pressure is released automatically, garnish with the nuts of your choice. 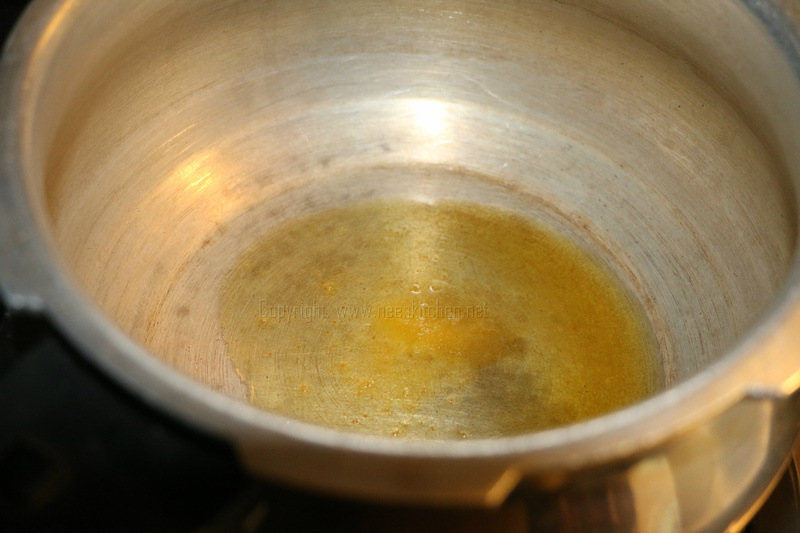 If there the pongal is little watery, do not worry just cook for 2 or 3 minutes it will get thicken automatically. Dates Pongal is ready to be served. You need to grind the black rice, else the cooking time will be altered. Soaking of black rice is a must else it will not cook properly in pressure cooker. You may use chana dhal like how you cook the regular sweet Pongal. 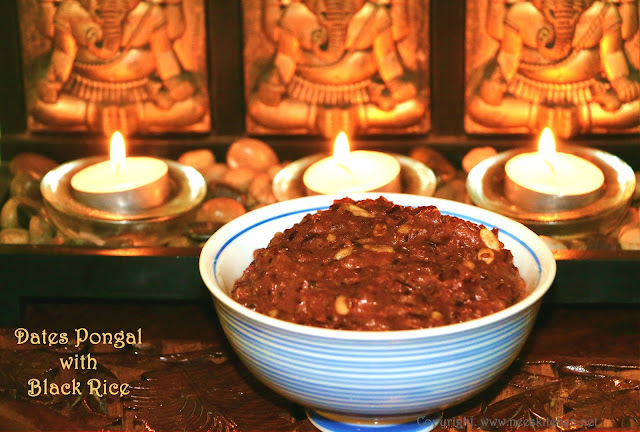 You may cook this Pongal in the regular method like how you do with jaggery but replace the jaggery with dates.